Video wallpapers are a great way to add a little fun to your iPhone, and for a long time, our favorite such app was vWallpaper by Skrew. Now, several years later, the successor ( vWallpaper 2 ) has arrived, and it brings with it a host of new features as well as true support for the iPad and the iOS 5 untethered jailbreak. Both vWallpaper and vWallpaper 2 are jailbreak apps, and only available through Cydia by adding a source and downloading it through there. 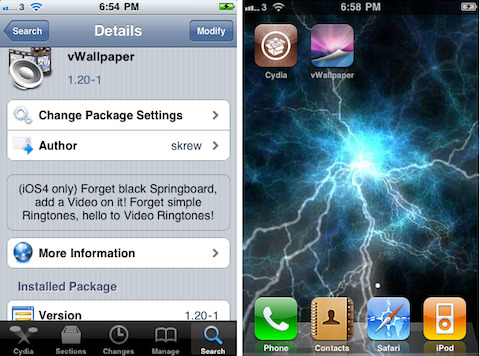 Once downloaded from Cydia, you’ll be able to install vWallpaper, customize it and add new wallpapers with little fuss. The getting there part, however, can be a little confusing for newbies. Fortunately, plenty of online tutorials walk you through the process. The other issue first-timers are likely to encounter is a conflict with a custom WinterBoard theme. The standard theme is fine, but most other themes interfere to some degree. This is a bigger problem with vWallpaper than with vWallpaper 2, but it still crops up. So if you start vWallpaper and nothing at all happens, then that’s the likeliest culprit: Disable any running themes. The biggest difference between vWallpaper and the vWallpaper 2 application is that the original was getting a little long in the tooth. It’s still a viable option for those using iOS 3.x, but vWallpaper 2 added support for iOS 5, and it runs on the iPad without jumping through hoops, as well as the iPhone and iPod touch. The new mod also has a much wider range of settings and wallpapers. For the purposes of this review, we used the iPhone app, and focused on vWallpaper 2. The vWallpaper 2 jailbreak app runs similarly on the iPod touch, so everything we say here applies there as well. With the iPad, be aware that the original vWallpaper hack does not support it natively. The new mod does support the iPad and iPad 2, but we did not test either platform for this review. So what vWallpaper does is transform your home screen using live or animated HD video. In addition to video, it also boasts a wide array of effects, such as particles and 3D objects, and HTML widgets. Both apps are completely free to download and use, and they both have excellent wallpaper libraries. Users can download new wallpapers at no cost, and the program lets them manage their local wallpaper collection. Another neat aspect of vWallpaper is that its supports custom-made wallpapers, which makes the potential for this software practically limitless. Our only gripe is that we wish the import mechanism were seamless and more robust. As is, it all feels like a bit of a hack, and it might be too much for casual users. Once you’ve done it once, however, it’s not too bad, and you’ll be able create videos right from your phone and ones converted from YouTube or similar. 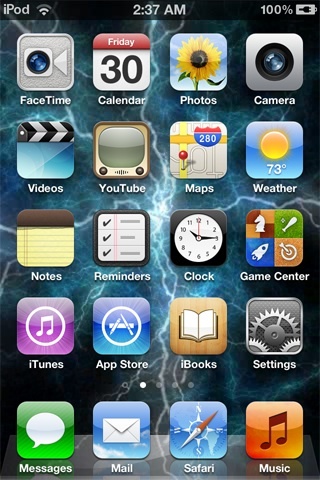 In addition to iOS 5 and iPad support, the vWallpaper 2 application added a lot of performance and stability improvements. First-time users aren’t likely to notice, but if you’ve used vWallpaper in the past, the new performance is impressive. The old iPhone app had a nasty habit of running into a conflict and simply crashing. It wasn’t something you couldn’t recover from, but it was incredibly annoying, especially when you were right in the middle of something important. That doesn’t happen anymore. The other big benefit to vWallpaper 2 over vWallpaper is the sheer size of the wallpaper library. It includes a wide range of new wallpapers as well as all the backgrounds previously available for the original vWallpaper. Those look just as good, and in some cases better, than they did back then. And for those of us who tend to change wallpaper often, this collection really is big enough to let us do that for a long, long time without ever growing bored with it. AppSafari review of vWallpaper & vWallpaper 2 was written by Joe Seifi on January 9th, 2012 and categorized under Cydia Apps. Page viewed 10636 times, 2 so far today. Need help on using these apps? Please read the Help Page.